The term "Gibson Girl" refers to the woman of the popular pen and ink drawings of illustrator Charles Gibson, which came to represent the spirit of the early twentieth century in America. The Gibson Girl is probably the best remembered of the artist’s images. 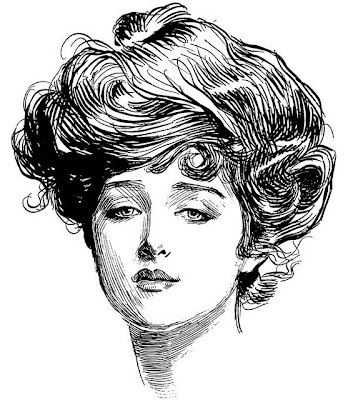 Some argue that the Gibson Girl was the first national standard for feminine beauty. The images of her epitomized the late 19th and early 20th century Western preoccupation with statuesque, youthful features, and ephemeral beauty. She was portrayed as the feminine ideal in elegant dresses, bustle gowns, shirtwaists, and terraced, shorter skirts. With her hair piled atop her head and a waist so tiny as to defy belief, the Gibson Girl represented a serene self-confidence that could surmount any problem. She was the independent women of the era*. The lockets were part of the original marketing of the Gibson Girls. Right now, these lockets are hard to find. When I'm looking for the lockets, I look for ones that are not monogrammed on the backside. This way, the person who buys one can personalize them. I also string them on pearl chains. This gives the vintage locket a modern twist. I hope you enjoy the Gibson Girl Locket as much as I do.